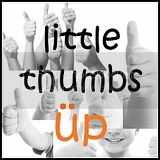 Welcome to Little Thumbs Up! It's a series of cooking / baking blogging events that we had organised from Feb 2013 to March 2016. We are sorry to inform you that there won't any Little Thumb Up anymore but please feel free to browse the collections of recipes that we have cooked or baked previously.